Regular readers around here should know how much I love (attempting) to solve puzzles. Alternate reality games and other stuff like that I mainly love to do, because of the fun of solving those type of puzzles. I still have to blog about a puzzle quest my brother set up for me as a Christmas present (the photos I made of the “puzzle” didn’t come out right, so that’s why there’s a delay in this post), but suffice to say I’m completely addicted to them. Anyhow, another fun game (not sure if I should call it a ‘game’, but I can’t think of a better word) that fits with my addiction is MacHeist. The main idea behind MacHeist is the sale of the MacHeist bundle, a collection of Mac shareware applications (for only $49). What I love about it though is in the weeks leading up to that sale, there are the MacHeist missions, filled with puzzles, a great storyline and free Mac apps. All you need to solve this puzzle is in the picture. The puzzles after this one are pretty easy too, but trust when the real MacHeist starts it will get more complicated. 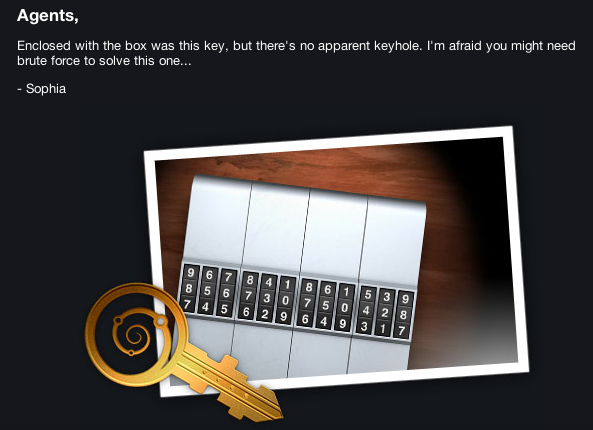 Check it out at MacHeist.com and solve the next puzzle!